This is a UML diagram I created for the Open University Digital Archive project I worked on as "Metadata and Web Officer". It is a Fedora diagram of the linked data relationships planned for the online courses that would be archived within the system. It was a work in progress. 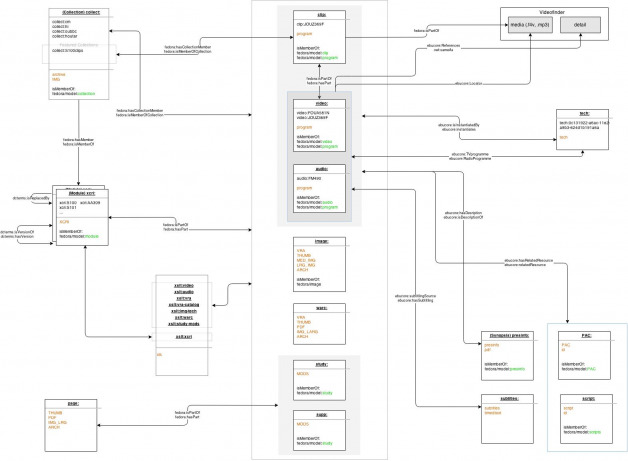 I created the diagram usng the Draw.io open-source online software package. This is a poster I created for the Open University's "Learn About Fair", held in the Institute for Educational Technology. 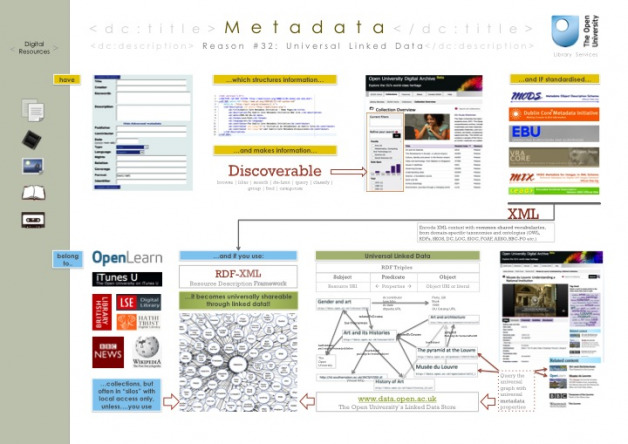 The poster describes how the Open University Digital Archive (OUDA) project utilised metadata, and that this metadata harnessed the power of linked data using the SPARQL endpoint at data.open.ac.uk to share its resources across the university and, potentially, globally. This is another paper I wrote for Dr. Thomas Martin, Professor Emertus of Information Studies at Syracuse University, for a course entitle "Telecommunications and Information Policy". This is a paper I wrote for Dr. Thomas Martin, Professor Emeritus of Information Policy at the Syracuse Unviersity School of Information Studies. The course was entitled: Telecommunications and Information Policy. The paper is unpublished, and was written in August 2008. 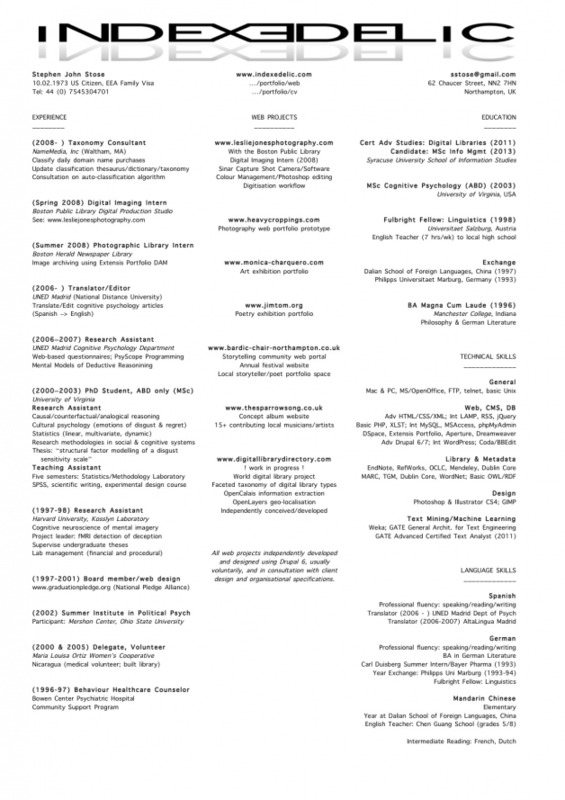 I've finally bent to market realities and created a one-page résumé. A good move, I believe, and hopefully not too unconventional in design. Recently I was invited to the University of Northampton to give a talk on the following question. I first interviewed for the role of Web and Social Media administrator. This was a content producer/editor role requiring basic HTML and CSS editing skills as well as the ability to adapt to university writing conventions. Unfortunately, they considered me overqualified for this role. Instead, they asked me to interview--which included giving this job talk--for a position I may have been slightly underqualified for, given that I have little reportable management experience. Set up for failure? 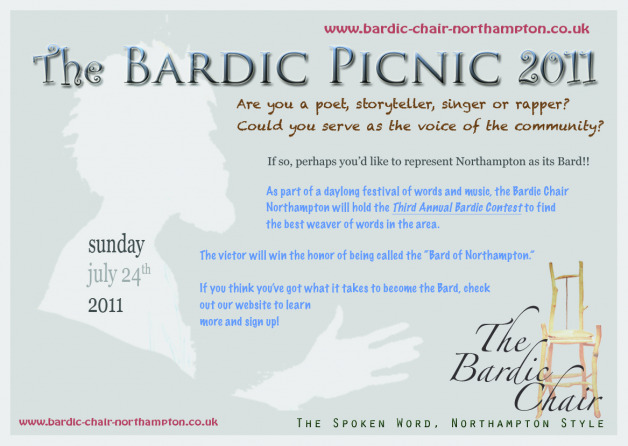 This is a pity, as growing within the university in any role would have made life in Northampton much easier, and a joy. 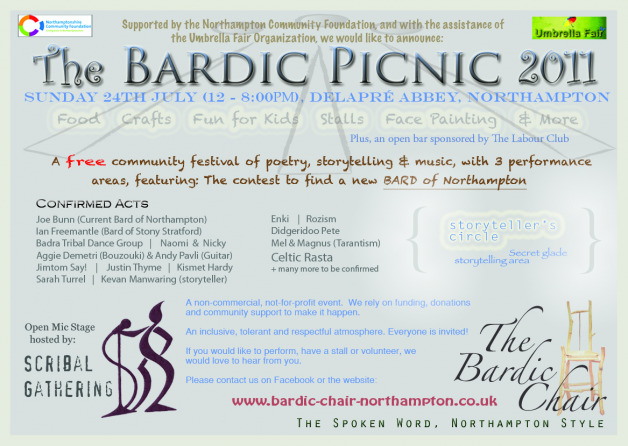 I designed this flyer, the front side and the back side, for the 2011 annual Bardic Picnic, held in the market town of Northampton, UK. 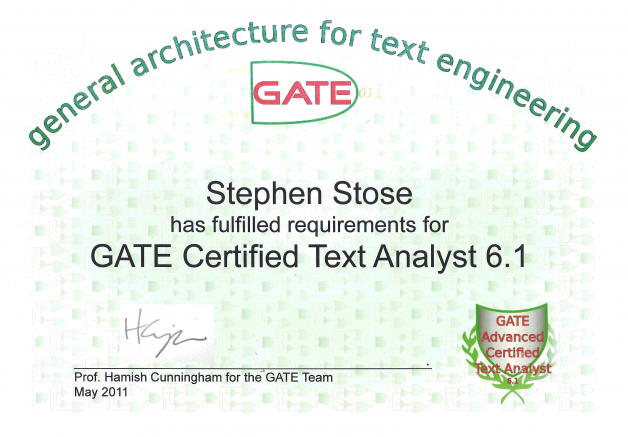 In May I attended the GATE (General Architecture for Text Engineering) training course. I attended the advanced Track 3 and Track 4. To become GATE Certified, one has to pass at least 3 modules, and to become GATE Advanced Certified, you have to pass at least 6 modules. I've now passed all 7 of the modules I have taken, qualifying me with the title of GATE Advanced Text Analyst of GATE Version 6.2. My name will soon appear on GATE's Hall of Fame. The fourth painting in the Hood Street series I've been painting here in Northampton, The Mounts, UK. This is the report that accompanies the work I did in Machine Learning using GATE to discriminate Digital Library web sites from all other web content. The presentation for the same work can be found here. This is the talk for a project completed for a graduate course on data mining at the Syracuse University School of Information Studies. The professor was Howard Turtle, and he guided me in completing a project in text mining using the GATE software. The talk has a twofold purpose: 1) to learn and teach my colleagues about the natural language processing suite known as GATE (General Architecture for Text Engineering), especially with regards to its Machine Learning (ML) capabilities; and 2) to utilize the GATE architecture in order to classify web documents into two groups: those sites that function as digital library sites (DL) distinguished from all other non-digital library sites (non-DL). I also wrote a paper discussing the natural language processing capabilities and the machine learning algorithms for web classification using GATE. The paper also discusses the details and results of the studies completed in more detail. Additionally, I will be attending a training course to become an Advanced GATE Certified Text Analyst from May 16 to 20 within the University of Sheffield's Computer Science Department. 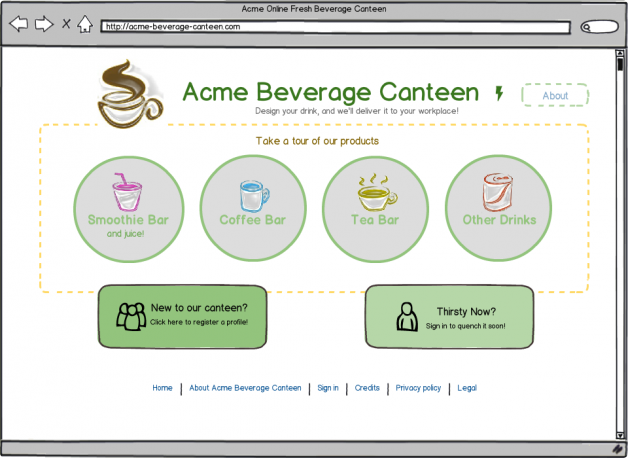 Testing for issues and web compliance (e.g., W3C) compatibility in a Mac environment is not easy. It used to be that you had to both pay for licencing to one of the proprietary virtual machines (e.g., Parallels or VMWare), and also pay for Microsoft Windows licensing. I recently, however, ran into an open source alternative to these virtual machines, and it works wonderfully. It is called VirtualBox. 3.x, Linux (2.4 and 2.6), Solaris and OpenSolaris, and OpenBSD. Given that IE6, IE7 an IE8 do not always run on the same Windows installation (IE6 & IE7 do not run on Windows 7 at all), you have to install multiple versions of Windows. VirtualBox can run multiple virtual machines simultaneously, so this is no issue. To get IE7 & IE8 (and IE6 if you wish), I installed Windows XP two times. I installed two versions of XP, labelling one "Windows XP IE7" and the other "Windows XP IE8." 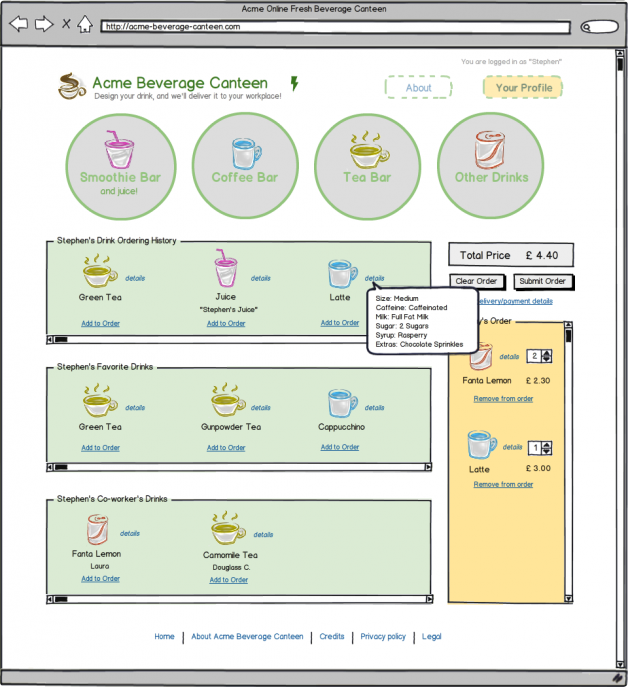 Within each virtual machine, you download and install the corresponding browser, and presto! 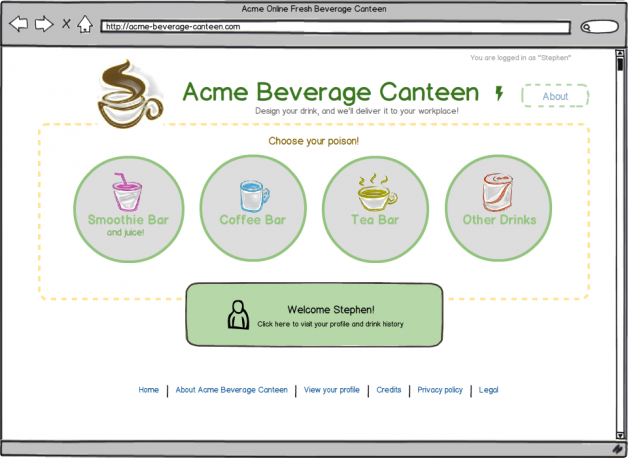 You can then test your web development in five or six different browsers at once. I usually test in Firefox, Safari, Chrome and Opera (Mac-based versions), but now can simultaneosly test in IE7 and IE8 within both virutal environments, all open within the same Mac environment. No need to shut down or have two machines. This is a nice introductory tutorial on the subject. It seems as if RDF fields will be mapped onto the CCK fields, such that RDF tags--using various vocabularies (OWL, Dublin Core etc)--can tag each content field as such. The DrupalCon Copenhagen video is found here, and a new Drupal Semantic web site is here. 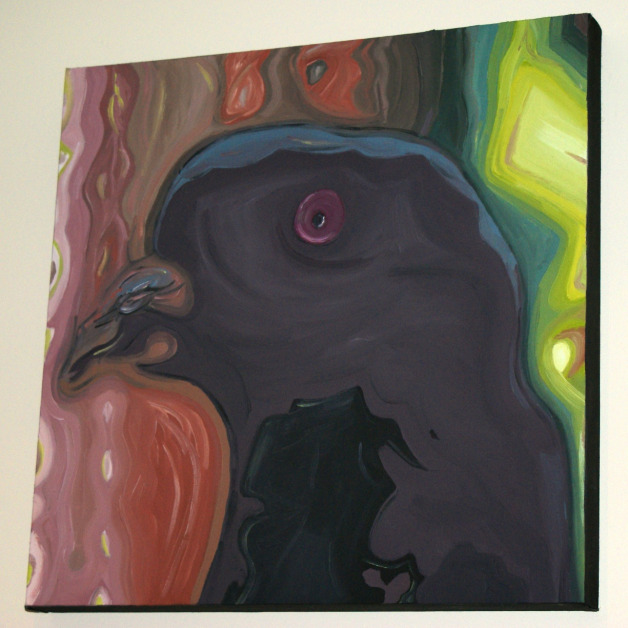 This is another painting in a series I've been working on here in Hood Street, Northampton, UK. Here is a Photoshop mock-up of a history website I conceptualized. 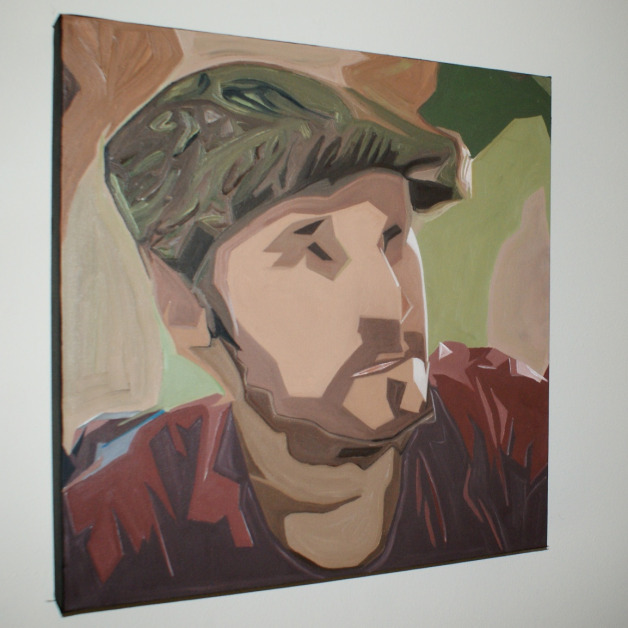 Really, this work illustrates some of my abilities using Photoshop CS4 on a MacBook Pro. 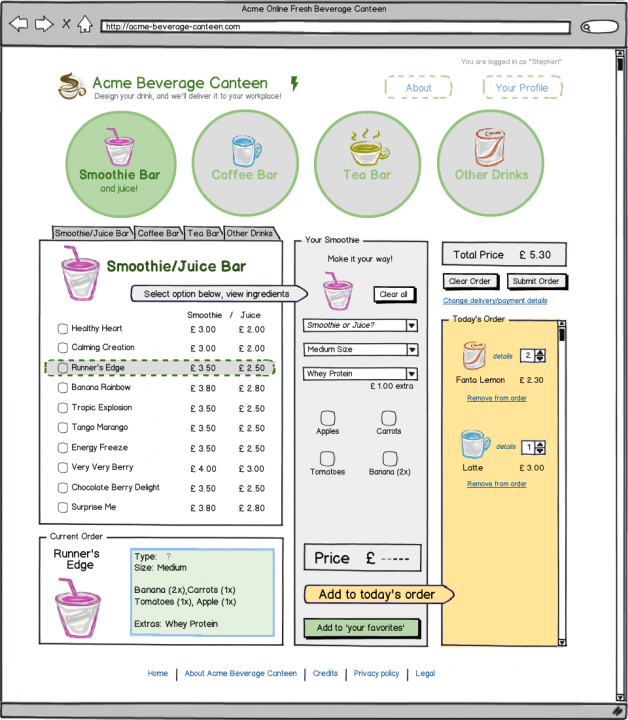 Many companies utilize these mock-ups as the information architecture they present to clients before developing the xHTML/CSS schematics of the site in question. While I usually just design a website without a mock-up, I figured I needed practice in developing my skills in information architecture. 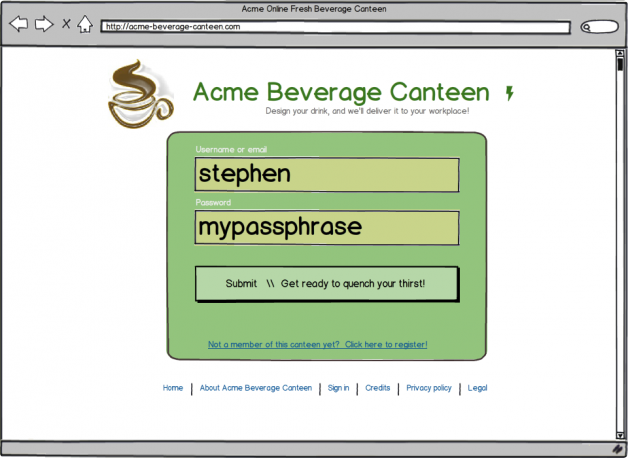 The next step would be to develop a work-flow of this product and the links contained within it. This is a project in a class on Digital Asset Creation and Management at the Syracuse University School of Information Studies.The literature review found in this study can also be found on my network in Mendeley in the group "The Semantic Web in Digital Libraries". This is an interview with Christine Madsen, who is currently finishing her Ph.D. at the Oxford Internet Institute (OII). I met Christine while living in the UK, and she was happy to both introduce me to the OII and field questions for this article. The article was in fulfillment of a class on digitization methods at the Syracuse University School of Information Studies. 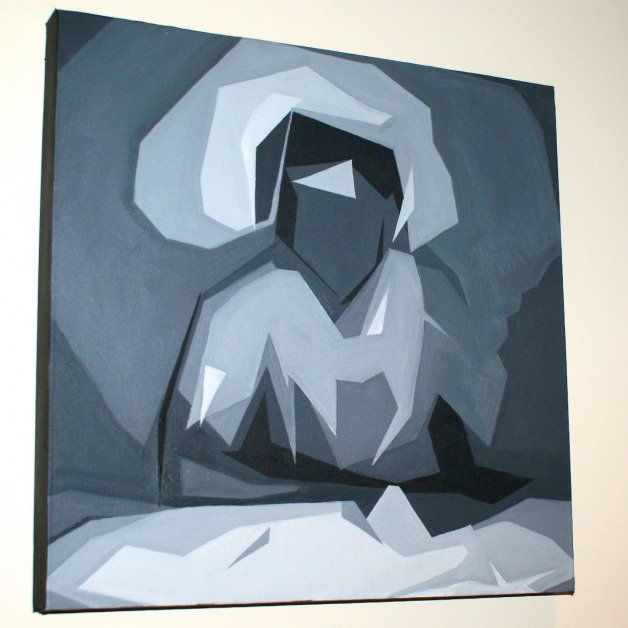 This is the first of a series of paintings I'm doing here in Northampton, UK. This is another assignment from Jian Qin's graduate seminar on Digital Libraries at Syracuse University School of Information Studies. In it, I develop five (5) distinct criterion for comparing digital libraries, then proceed to make the comparisons in a systematic way. Indeed, I personally feel the criterion I developed are more useful than those proposed by Saracevic (2005) and Choudhury (2002), though this model I will neither test, nor believe such kinds of models of better/worse criterion are particularly useful, other than excercises in thought. 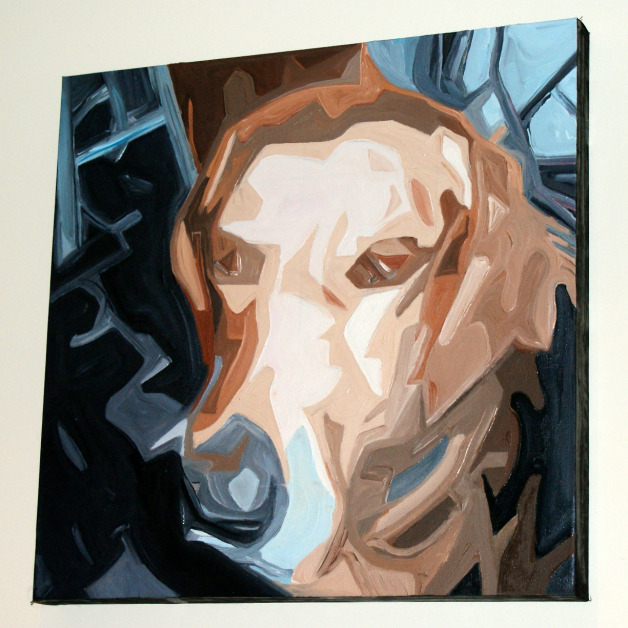 It has been about a year or two, but I've started oil painting again. This is one I did last month. Over the next few weeks, I'll upload five or six more oil paintings, some of which I've done here in Northampton, UK, others I've done in Madrid, Spain. A very interesting company in Australia doing fantastic work: Pixelcase. They specialize in web video and photography, and have compiled a wonderful portfolio of virtual tours of different cities, including NYC, Melbourne, and Sydney. 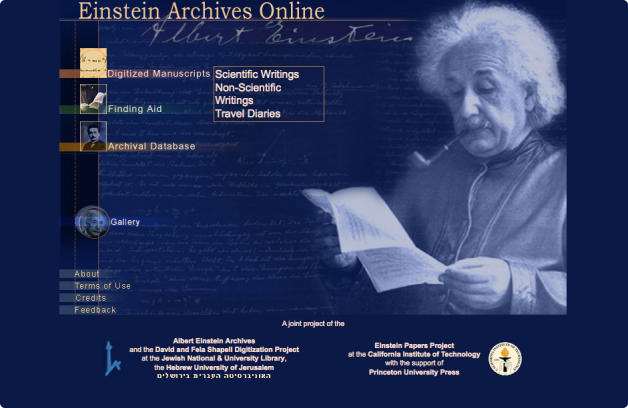 The Einstein Archives Online is sponsored by the Hebrew University of Jerusalem, Princeton University Press and the California Institute of Technology. It brings together more than 40,000 documents in the collection of Albert Einstein, plus an additional 30,000 documents classified as Einstein-related. 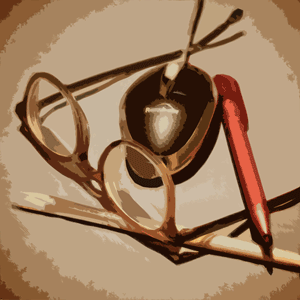 The site is very simple, clean and dedicated to a single topic. 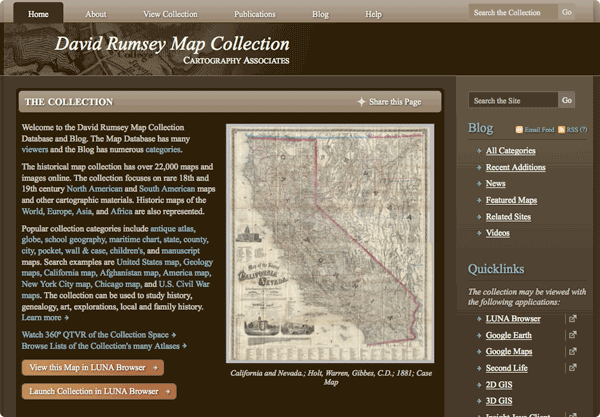 The David Rumsey Map Collection is a production of Cartography Associates. 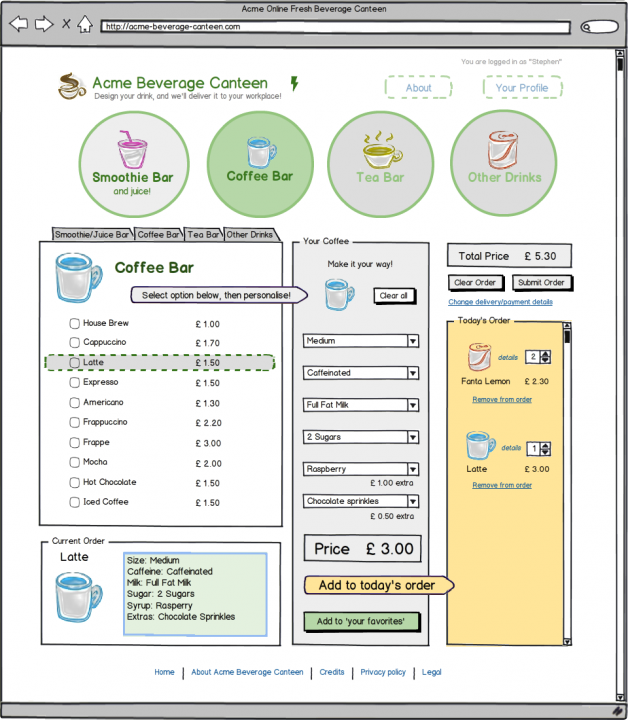 The establishment was founded in 1996 by David Rumsey, who is also the director of Luna Imaging, a software enterprise system for managing online images. Rumsey's collection of maps stems from 1980 and is one of the largest private collections in the United States. 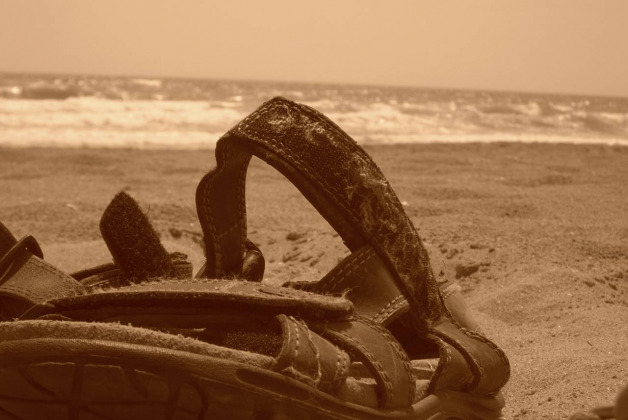 In looking for directories of different digital library sites, I came across the “Arizona Memory Project.” I chose to write about this project as it both attracted me in its organization and usability, while also leaving many aspects that in my opinion could be easily improved. 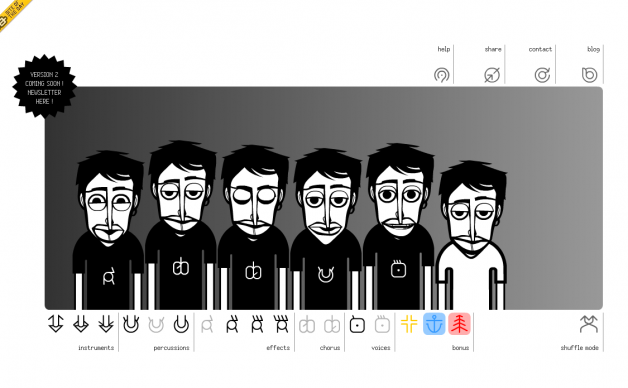 It is a digital library of images, text and sound. I'll mostly be referring to its images, as that is the medium I explored most. As position changes, I see around three or four different 2-D pictures here, plus a varying range of 3-D perspectives sticking out. Guess I'm going to have to make my way north to the British Museum in London to check this and others like it out. our planet, from without and within, if it had a ring much like Saturn. Disruptive Technologies: Prediction or just a set of recommendations? This is a paper I wrote for a class in Information Management given by Dave Dischiave of the Syracuse University School of Information Studies. Theories of management, to me, are quite basic and theoretically circular. This paper illustrates how what management specialists call "prediction" here is both faulty and quite misleading.